Your Guide to the Best Wedding Dress Shops in L.A.
A wedding dress is one of the most important things you'll ever shop for in life, so knowing all your options for finding "the one" is of utmost importance. If you have the advantage of living in or near Los Angeles—or maybe plan to make the trip to shop for dresses—you're in luck, as there are plenty of bridal boutiques to choose from. That said, having a lot of options can also be more than a little overwhelming, so we did some research and found the best wedding dress shops in L.A. Whether you are looking for a dress worthy of a princess or are more of a boho bride, there's something in the City of Angels for every bride-to-be's aesthetic. 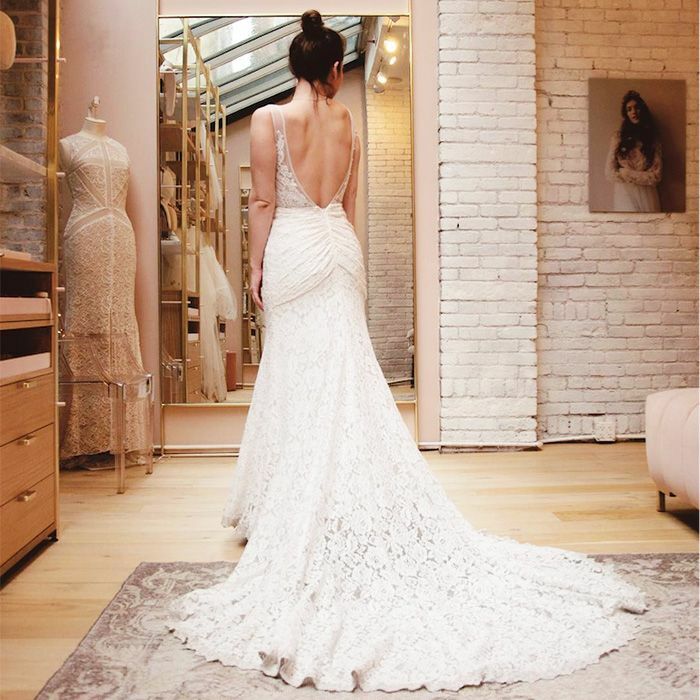 Among these fashion girl–approved wedding dress shops are the best department-store bridal salon on the West Coast (in our opinion), indie shops in Venice Beach, and more. Originating in San Francisco but now with a location on Melrose Avenue in L.A., LOHO Bride (short for "league of her own") is the go-to destination for fashion girls looking for cool dresses by under-the-radar designers. Bride Boutique, located in Los Angeles's cool Echo Park neighborhood, is another great choice if you're seeking lesser-known designers. Most of the gowns here fall between $2500 and $3500. It goes without saying that it doesn't get more showstopping than a Monique Lhuillier wedding gown. Engaged fashion girls flock to her Melrose Place location in droves. If you love the pretty boho look and want to find your wedding dress in an actual castle (seriously), get thee to Claire Pettibone on Beverly Boulevard. When it comes to selection, the bridal salon at Saks Fifth Avenue's Beverly Hills store is a dream come true. There, you'll find dresses by Reem Acra, Marchesa, Amsale, Berta Bridal, and Oscar de la Renta. With locations in select cities across the U.S., Lovely Bride's boutiques are filled with gorgeous gowns by the likes of Alexandra Grecco, Savannah Miller, and Anna Campbell. The gorgeous L.A. location is in Pasadena. San Francisco–based Kinsley James's new West Hollywood location is filled with gowns by designers like Marchesa and Anne Borge. If you're looking for something unique and customizable, be sure to make an appointment here. Sarah Seven's flagship location, conveniently located near The Grove, is a must if you want a relaxed, modern dress that's easy on the budget. Della Curva caters specifically to brides between sizes 16 and 34, and even has its own private label among the offerings. It truly doesn't get more boho than Solstice Bride, located (fittingly) in Venice. Here, you'll find dresses by Stone Fox Bride, Anais Anette, and more. But here's a heads-up: They close for the summer. Anthropologie bridal offshoot Bhldn's Beverly Hills location is a one-stop shop for everything from under-$2000 wedding dresses to bridesmaid dresses to any other accessory you could possibly need. Aussie export Grace Loves Lace's Venice salon is the place to get the brand's hard-to-find vintage-inspired gowns made of stunning French lace. Next up, find out what to remember to buy when you get engaged.